One of the most popular methods used to reduce and eliminate social anxiety is cognitive behavioural therapy (CBT). It utilizes the idea that various recurring thought patterns and behaviours are linked to physical and emotional indicators of social anxiety. 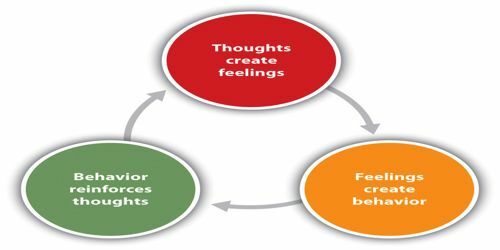 CBT is a process of identifying, analyzing and changing these thought patterns and behaviours with the result of reducing the overall anxiety. CBT has been stringently applied to many people with anxiety and depression, and it has proven to be more effective than any other psychological techniques, and just as effective as medication (without the side effects). Cognitive behavioural therapy works around the idea that thoughts affect behaviour and vice versa. Therefore the re-programming of both is likely to change the situation. Figure – The cognitive behavioural model of social anxiety devised by Clark and Wells 1995. This version was adapted from Butler 1999. The trigger situation refers to the situation that activates the bout of anxiety. This can vary from person to person but often includes things like answering the phone to someone you don’t like talking to, or walking past a group of people you know in the street who stop and talk to you. For some people the situations might be more specific, such as the weekly meeting at work or a formal chat with your boss. 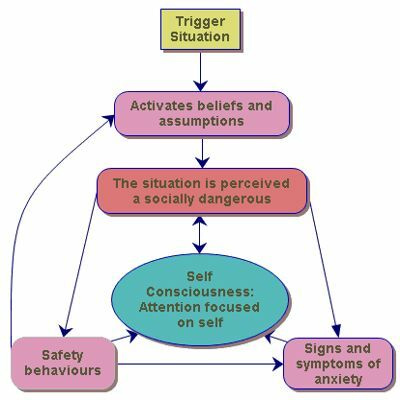 The trigger situation activates the beliefs and assumptions the person has about them self, the specific situation, and social situations in general. Safety behaviours. These are behaviours developed to minimise the anxiety felt at the time and avoid further exposure to potentially greater anxiety. For example – leaving the situation to avoid further embarrassment, or changing the subject to something you feel confident talking about. Self consciousness. This is when attention becomes focused upon oneself. For example – becoming very aware of how much or how little eye contact you are making, or being very aware of your shaking hands. Signs and symptoms of anxiety include increased heart rate, sweating, quivering voice, breathing becoming heavier and starting to shake. These three responses are interlinked. Self consciousness increases the feeling of anxiety, which increase the perceived threat of the situation, which can in turn increase the signs and symptoms of anxiety. If you feel at risk, this activates safety behaviors which can confirm that the situation is dangerous. CBT is a tried and tested method for helping to relieve the anxiety caused by social situations. Often people are referred to a cognitive behavioural therapist by their doctor. However getting referred to a cognitive behavioural therapist can sometimes be quite difficult for somebody with social anxiety. For a start it involves explaining the problem to a doctor, which some people may find difficult, and secondly there are often long waiting lists for therapy, and sessions can be quite sporadic. Whilst someone who is referred to a therapist will gain the benefit of experienced one to one counselling and group workshops, there are a couple of very useful self help books which if used properly, will give you a programme of cognitive behavioural techniques which you can use on yourself. Most of the following techniques either come from, or are adapted from Gillian Butler’s excellent book “Overcoming Social Anxiety: A self-help guide using Cognitive Behavioural Techniques”. The book goes into far more detail and covers a lot more then what is mentioned on this page, but some of the aspects on this page should be quite helpful. Use a diary or electronic organiser to record and monitor your progress. The first thing to do is to identify your thoughts and beliefs. Thinking plays a big part in several of the processes involved in social anxiety. If analysed properly, thoughts can be categorised into beliefs, assumptions and attitudes. Knowing what type of thought you are thinking is essential in changing them. Beliefs – A belief is a thought that you make real or feel is true. A socially anxious person may believe that other people are generally hostile and will ridicule any weaknesses observed in them, or they may believe that they have a generally un-likable personality. These beliefs may have stemmed from bad childhood or past experiences. Many beliefs are dispositional in that they exist but have never previously been analysed and been questioned. Some beliefs are also limiting in that they inhibit one’s actions. It can be hard to identify deep seated beliefs, as the belief may have formed years ago in response to a situation which may have been forgotten. Beliefs play a big part in behavioural responses. Someone who believes that people are generally hostile may think that it is dangerous to tell people too much about themself and avoid too much small talk. What do you feel were your short falls? In what way are you judging yourself? What did the situation mean to you? What did the situation mean about you? What were the attitudes of others in the situation? What does this tell you about them?